Before I was Dexter's Mommy I was also Mommy to Daisy and Cooter. For those of you that read my blog often, you have seen their furry, mischievous faces around here. Well, for as long as I can remember, I have always been careful about what I clean my floors with. To tell you the truth, I dreaded cleaning the floors because I didn't want any chemicals to be ingested by the dogs. Well, now that I have a son, this is even more important. He eats anything and everything and he could care less if it has been on the floor for 5 seconds or 5 hours!! The other day I had arrived home from work around 9:30pm. The last thing I expected to find was a UPS box with my Steamboy T1 in it. I couldn't resist. I had to open it. I looked at it, read the instructions and I couldn't help myself! I HAD TO CLEAN. All I had to do was screw in 2 screws and put a microfiber cloth on the mop head and away I was!! There were juice stains, food splatters and lots of gunk on my floor. The Steamboy T1 was completely unfazed! It not only took up all of the mess but it didn't make my floor wet either (only warm to the touch!) I was so amazed. It was easy to push/pull and it was a breeze to set up. My husband was even impressed!! Next, I figured that I couldn't stop while I was ahead. I ran out to our huge mudroom and swept it. I then brought the Steamboy T1 down there and cleaned the whole floor in mere minutes. I AM IN LOVE. I remember having read in the instructions that you can use the Steamboy on carpets too just by slipping a carpet attachment over the microfiber cloth. Well, about a month ago Dexter had spilled something (probably juice) on the carpet and I was unable to get it out---until now! I used the Steamboy and within minutes my carpet was free of stains!! This Steamboy that I speak of retails for $99 and includes free shipping. This steam mop will more than pay for itself with all the money you will save paying for floor cleaners!! The fantastic people over at Reliable Corporation would love to give one Dexter's Super Savvy Mommy reader the chance to win their very own Steamboy T1 Steam Mop! How cool is that?!?! You might thank me but your floors will really thank me!! All you need to do to win is visit Reliable Corporation and find your favorite product that they carry other than the Steamboy T1. Come back here and tell me which product you adore AND why. Also include your email address otherwise you are not eligible to win. Other than the Steamboy, I love the Enviromate steam cleaner. Why? Because I have five cats and tile everywhere. Need I say more? I like the DIGITAL VELOCITY™ V95 for our ironing. Ironing Board! Now why do I love it you ask? Because MY old ironing Board is 25 years old and is in dire need of being Replaced! The HOME Table is really nice and just might make ironing a joy?! And Dexter is adorable. I have 2 girls, no boys for me! I think I would also like the ENVIROMATE™ T630 STEAM CLEANER. I never even knew such a product existed! My niece has a jewelry business, this would be fantastic for her to have. I like it because it's so professional. I found your site because I have you bookmarked! IronMaven J420 because I hate to iron, but if I've got to do it, I'd like equipment that does the job right! I also love the Digital Velocity iron because of its innovative temperature control system! the home iron - ironmaven J420 seems awesome!! I like the ENVIROMATE™ T730A STEAM CLEANER, I'm obsessed with riding of germs since having my son 9months ago! The DIGITAL VELOCITY™ V95 iron looks like a good one! The g4 Fabric Steamer looks SO nice! I hate ironing! I would love the jewelry steam cleaner because I hate putting my good jewelry in chemicals to get them clean! I love the dreamstitcher 787, i'd love to have it because i don't own a serger, and i've been wanting to get one for the longest time and they are so expensive, haven't been able to afford it, i love sewing and making my own clothing or reconstructing old clothes, repurposing clothes as well, and this serger would come in handy! The IronMaven looks super powerful and I bet I could get some serious ironing done with that puppy! Yay! Having hardwood floors it's difficult to find something that is safe to use on them. The steamboy would be the perfect soltuion. I also like the THE BOARD C60 which would make my ironing much easier. I originally found your site through the latest blog carnival. Wow, Who knew there were better ironing tables out there. I'd love the C81 VACUUM & UP-AIR BOARD. Wow! I would love to try the iorn maven it would make my life so much simpler. Seems effortless to use. Thanks for the great giveaway. I think the Ironmate is great. I like the G4 FABRIC STEAMER. I would love the ENVIROMATE™ T730A STEAM CLEANER. First of all, chemical free cleaning with a baby on the way and a spoiled dog is ideal. It's cheaper than buying chemicals, versatile, and oh so cool. I am buying our first house this summer, and this would make cleaning the big sucker much more fun!! Husband has already informed me that we are not getting a housekeeper, and I'm all about easy...so this would be great. I love the ENVIROMATE™ T730A STEAM CLEANER because it cleans without the chemicals! I'd be willing to try all of the things on their site, even though I'm not sure that I could figure out how to use some of them. :-) My vote is for the LED task light. It looks pretty versatile. With that said, I could REALLY use the floor cleaner, so I will be hoping and praying that your random number picker picks me! I think I found your site by accident while googling something. The IronMaven™ J490A "you’ll never have to worry about running out of steam in the middle of ironing again" sounds wonderful! I found you through Prizey! Thanks! FABRIC STEAMER looks awesome. I never ever make it to the dry cleaners and a good steam would really help out my delicate clothes. I am following you on blogger! today I came to your site from Giveaway Spot. I also like the THE LONGBOARD™ C55LB. Looks like it would make ironing easy. Thanks for the giveaway. I found your site via Prizey. Thanks for the giveaway. IronMaven J420 ..then maybe I would iron. great giveaway! a friend told me about your blog. PANTMAN™ F5 PANT PRESS. Save time ironing my husband's pants. And they'd be done better, too, than with my dinky hand iron. OMG I was just telling myself this morning that I should look into a two needle sewing machine! While I wish I could afford one if I had the chance I'd totally get an industrial strength 2 needle machine! They also carry an industrial serger! I'm in love! I found you on APA! We are getting ready to move and could definitley use the Enviromate T630 Steam Cleaner! I love the ENVIROMATE™ T630 STEAM CLEANER because I have tile all through the house and 2 babies crawling around all the time...it seems like all I get done is mopping! I also love that it offers chemical free cleaning! I found your site through Pitch Bloggers...love that place! The Enviromate T630 looks great too. Love that it doesn't use any chemicals, but works on the toughest areas. I would love knowing our floors are truly clean! My husband would appreciate the digital velocity iron. . . since he has to do his own ironing. The MSK-8900M sewing machine looks awesome! It's so fast with 5,000 rpm high-speed operation! The Enviromate is really cool! I am following you now on Blogger. They have 3 Stainless Steel Jewelry Steam Cleaners, one of which is the i500A STEAM CLEANER. I love for my jewelery to sparkle. I like the EMPRESSA™ S300 STEAM PRESS because I am a seriously lazy ironer and this product claims to take the work out of ironing. Bring it on, baby! I like the Digital Velocity iron, it has great features like a LCD display! I like the DIGITAL VELOCITY™ V95 home iron. Because it allows you to use more steam on a lower heat setting. So you can iron without damaging your clothes. I'm following you on Twitter and I've tweeted. I found your site from watching tweets on Twitter. i like the DIGITAL VELOCITY™ V95 because it has temperature control which will really help me when ironing different fabrics. my current iron is 10 years old and very old fashioned so you can imagine how much guess work i have to do! I like the Digital Velocity V95 Iron. If I had this I might enjoy ironing more than I do now. I came to your site from another Mom Blog, but don't remember which one. My fav is The IronMaven J490A. It even tells you when it needs cleaned. How did I find you? I don't even remember. I was hoping you knew. I've tried to add you to my Technorati faves but it's been down for two days now. The Fabric Steamers are great because I hate ironing. The ENVIROMATE™ T630 STEAM CLEANER can be used to clean the entire house, not just the floors with the 11 peice accesory kit and it only takes 10 min. to heat up! The longboard ironing board would be great. I also like the uberlight for task lighting. with my disabilities the mop & the lights would be very helpful! I love the ENVIROMATE™ T630 STEAM CLEANER. I love that you can clean without chemicals! I spend way too much time ironing. The Ironmaven J490A sounds wonderful, and if it'll cut my ironing time in half, I'm all for it! I heard about your site from dolls123. I absolutly dread ironing so I would have to say the IronMaven J420 would be for me! 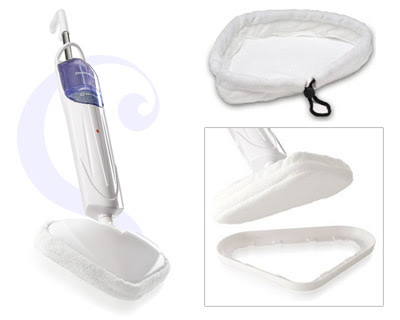 the g4 fabric steamer....i hate ironing so much! I love the MSK-8420B sewing machine. I've been wanting one forever and hope that I can buy one because there's so much I'd like to make for my home. I found your site on google blogs. i like the ironmaven because it looks like it could impress my husband, who is EXTREMELY picky about having his shirts pressed.